There is no busting up the champion drivers and team. But what will they be driving? Reigning V8 Supercar champion and current series leader, Jamie Whincup, and Australia's most popular tin-top driver, Craig Lowndes have re-signed with TeamVodafone for another three seasons, meaning the team-mates will be partners for a minimum of seven years. Vodafone Hutchison Australia has also announced it has renewed its sponsorship of V8 TeamVodafone under the Vodafone brand. The new agreement extends Vodafone's participation in the sport until at least the end of 2012. 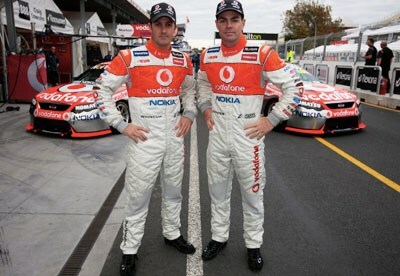 TeamVodafone has been the standout outfit of recent seasons, winning a total of 39 races in addition to its 2008 driver and team championship titles and two Bathurst 1000 crowns. With drivers and primary sponsor locked in, the only piece in the jigsaw left to put in place is what product TeamVodafone, a Ford stalwart until dumped by the Blue Oval, will be racing into the future. There have been rumours that the glamour squad may usurp the role of the Holden Racing Team as the factory squad for the red team. And of course V8 Supercars Australia has been desperate lobbying for other brands to join the two-make category and bring much-needed variety and an economic boost. So... Kia, Hyundai, Chrysler, Great Wall of China...? Team principal Roland Dane said the strategy to extend the naming rights partnership in combination with the re-signing of both drivers was a positive move for the Queensland operation. "Continuity from sponsors, drivers and team personnel has been one of the key factors to our incredible success over the past three seasons," said Dane. "Today is a historic day and we are very pleased and proud to extend our involvement with Vodafone at least until the end of 2012, along with securing both of our drivers for the same period. "Today's announcement will give us the best chance to remain at the forefront of the category as it continues to evolve over the coming years," he continued. Whincup, who recently and mysteriously suggested he may quit the sport by the time he turns 30, said the decision to re-sign with TeamVodafone until 2012 would be career-defining. "I am overwhelmed with the opportunities that have arisen since winning my first V8 Supercar Championship and I am thrilled to have agreed on a multi-year deal that will see me stay with the world famous TeamVodafone until the end of 2012. "The main factors that helped me decide my future were the great people at TeamVodafone, a fantastic major partner in Vodafone and the opportunity to remain driving alongside my good mate Craig Lowndes. "For me the focus is on results, so it is essential to have the most powerful sporting team behind me. Thanks Vodafone; your commitment is safe with us," he added. Multiple Bathurst winner Craig Lowndes said since the team had become TeamVodafone they had rewritten the V8 Supercar history books. "It is fantastic to be part of TeamVodafone until at least 2012. I have enjoyed every minute since joining the team and I am looking forward to even more success. "This extension will see me at TeamVodafone for a total of eight years which will be the longest period I have spent with any team. "The continuity between Jamie and I will serve the team well into the future and having a global brand like Vodafone behind us will really help us to continue our quest to remain at the top of our game both on and off the track," he added. There was nary a mention of Ford at the announcement.